I think this is bad. No wait!! I think this is very terribly bad!!! Very very awful and deeply deeply sad. So very sad. Money money money…. dominates too much. Dominates!! So the wealthy give money for specific things – and that doesn’t necessarily include ensuring an equitable society. Big money dominates choices made in corporations and charities and yes, government, too. Money = power in our society. Money to elect the people who maybe don’t much care about civil society and civic capacity and equity. Most money is held by a few. The few expect and demand certain ways of doing things. Too many donors have their own ideas about how to solve problems and do stuff and… Those few may not (probably do not) know the right stuff and understand the lives of those who experience life differently. I believe that philanthropy faces (has always faced) a moral dilemma…Big bucks. Wealthy people. Major gifts. The “right” people on our boards to get those major donors. (By the way, if there are major donors and major gifts – that means there are minor ones, too!!!!!) Read “Philanthropy’s Moral Dilemma,” the final chapter of Keep Your Donors: The Guide to Better Communications and Stronger Relationships (2008, Joyaux and Ahern). I talk about philanthropy as an opportunity to make change – and making change must must must include ensuring social justice. I’ve long thought that philanthropy was too much about the status quo. I want philanthropy to also be a subversive activity. I want progressive philanthropy that strives for social justice. And that means a broad, diverse donor base. This is what I believe: No healthy society can exist when only the wealthy play…lead…dominate…control. No matter the intentions of those wealthy. Some of the biggest most important movements in this country – and worldwide – weren’t led by or funded by the wealthy. Read this report. Talk about the values and meanings therein. Talk about the implications for your organization…for your local community…for your nation and the world. Talk about this report as part of a board meeting. (And yes, all senior staff and board members should read this!) It’s past time to talk about philanthropy’s moral dilemma. Way past time. I’m sad and hugely pissed. And not surprised. Say thank you better. It’s even more important than you think!!! New research PROVES how massively important saying thank-you really is!! Yes, I know that you know that saying thanks is important. Your mom told you so, right? Or maybe your grandma? At least someone told you so. Hey, people out there. This is real and valuable and applicable to any organization no matter the size. Imagine what the findings will do for your fundraising! The summary: Even subtle changes to communications have the ability to profoundly influence how good donors feel as a result of reading that communication. AND! There’s evidence that the recommended practices have the potential to increase average donation amount, response rate, and how good the donor feels and…. A few specifics: How/when to use an email thanks. Thanking donors who give most frequently. And……………….Download the research! Apply it! Report authors: Professor Jen Shang. Professor Adrian Sargeant. Kathryn Carpenter. Harriet Day. Sponsors…YES!!! Donors… The marvelously wonderful organizations that made this possible. In alpha order: Bloomerang Inc, Institute for Conversational Fundraising, and Pursuant Inc. So now I’m going to play around with thank yous. Without your leadership support, Pursuant, my clients wouldn’t know how massively important thank you is. Sure my clients know it’s important. But there’s so much else to do and…. So thank you Pursuant for your ongoing support of the Philanthropy Centre’s research. Gracias, Kent. We haven’t talked or seen each other in ages. How wonderful to see your support of critical research for fundraising. We’ve got a long way to go to strengthen fundraising – and your support helps us all move forward. Thank you so much. Hey Bloomie peeps… You know I love you. And again, you’re sponsoring critical research about donor retention. Thank you et merci!! With donors like you, we can help nonprofits around the world. Thank you again. And here’s just a bit of what our sponsors – our exceptional donors – say about the research findings. Their testimony reminds us of what great research can do. “…The time and effort used for proper acknowledgements is easily justified based upon the results of this study where significant increases in funding were realized!” So says Jay Love, Chief Relationship Officer and Co-founder of Bloomerang. Include your voice in critical research!!! Do you (and your organizations) want to raise more money? Then our fundraising profession needs MORE VERY GOOD RESEARCH. Research that helps us fundraise better. So add your voice to this important new research!!! YES. With just 16 minutes of your time, you can help design new research. YES! YOU! I just reviewed the survey. This is GREAT!! Please play. PLEASE COMPLETE THE SURVEY. I want the answers. You’ll want the answers. The results can help RAISE MORE MONEY!!!!!!!!! Ah neuroscience… So useful for fundraising. Surely every single fundraiser knows that giving a gift is not a rational decision. In fact, most decision-making is based on emotions. Sure, we might rationalize it within seconds, but even the rationalizing isn’t rational! Want more information on all this? And read Tom Ahern’s books and newsletter. Thanks to MRI machines, we can monitor what’s happening in the human brain. So here’s my story of my dopamine high! One day, I get a very nice email from EMILY’S List, indicating that it appears that I haven’t renewed my membership. And how much I matter as a member and what my participation has accomplished. I checked my checkbook and, as I had remembered, I had renewed. So I called EMILY’S List. A human being answered. I asked for the development office. A human being answered. Wow. Not caught in voicemail hell! The development officer immediately looked me up in the database. Quickly and efficiently. No referral to someone else! I had renewed. She apologized very graciously and corrected the entry. I wasn’t angry or even annoyed. Everyone makes mistakes. No big deal at all. Off I went to my appointments. I returned home and there was a very gracious email apology. Then a couple hours later, a personal call from the chief development officer apologizing. That was so unnecessary. No need for another apology!! What an amazing experience. Talk about a dopamine high! I tell everyone this story. I repeat this story over and over when presenting. Thank you EMILY’S LIST. You gave my brain a dopamine high. You made me admire you even more. Colin Habberton was talking about information and communications and weapons at the AFP Toronto Congress. SURPRISING SIDEBAR: So I’m reading the aforementioned NYT article. And 2 sentences in, the article refers to Milton Rokeach, social psychologist. Milt Rokeach?!!! He lived down the street from my family…on Lantern Hill Drive, East Lansing, Michigan. A family friend. Professor at Michigan State University, just like my dad. The Rokeach and Joyaux kids all went to school together. I knew him as the dad down the street. And I knew he was a psychologist. But now I know he was a social psychologist and developed a very important values classification instrument, the Rokeach Value Survey (RVS). With 18 terminal and 18 instrumental values. Check it out! Really cool. And various attempts haven’t “beaten” Milt’s instrument. Sure looks good for philanthropy. NOW BACK TO WEAPONIZING: Information has been weaponized. And wow is the internet and social media great for deploying the weapon! Bullying. Politics. Outrage. Manipulation. At AFP Toronto Congress, Colin talked about “demilitarizing information.” How can we do this? Can we use information as a weapon for good? Check out Colin’s work. Do some thinking on your own. Talk about this with your staff and with your board. And talk about this with some of your favorite marketing/communications people. Can we demilitarize information? 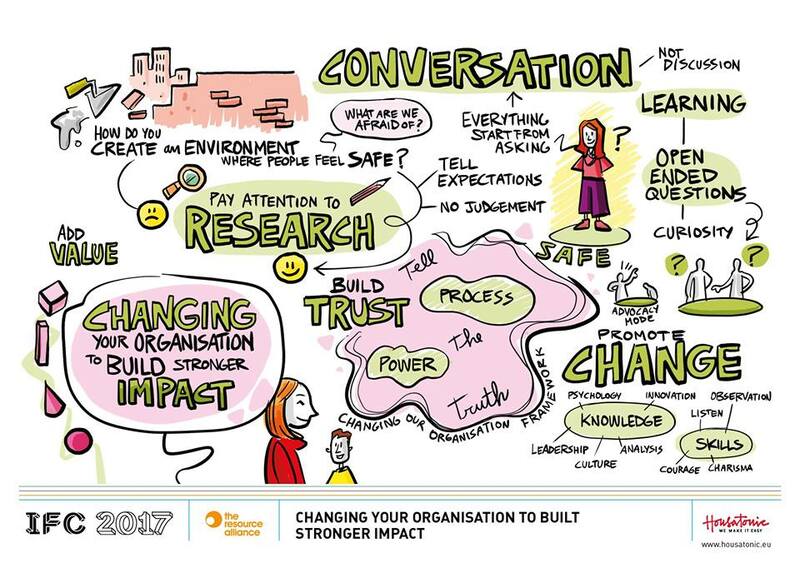 Thanks to the Resource Alliance, UK for the marvelous IFC 2017 (International Fundraising Congress). Truly international – and risk-taking. Imagine talking with colleagues all over the world... And you can always find and connect with people in the dining rooms reserved for IFC participants. Just sit anywhere… Perhaps you’ll be talking with Chinese and South African colleagues. Fundraisers and executives from Nigeria, Argentina, Slovakia, Thailand, Singapore, Canada, Scotland, Ireland, Italy, France, Autralia, Turkey, Jordan, Pakistan, Czech Republic, Germany…. And more…. Ahmen…Fundraiser and rapper…This is my favorite plenary session. Beautiful. Angry. Hopeful. Speaking out. Challenging us. 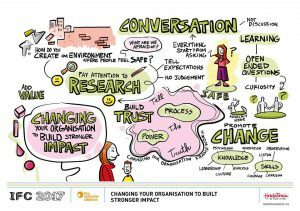 Have you ever seen live graphic documenting during meetings or presentations? It’s marvelous. And the IFC has this happening… First in 2016, I think. And again in 2017. And I hope forever!!! This is the graphic facilitation (by Housatonic) for my masterclass. You can see many more IFC drawings on Facebook. Please help: Survey about leadership…yours, mine, & others! Hail all leaders… CEOs, directors of development, team leaders, COOs. How do you behave? What’s your management style? How does this style make you a successful leader? Would you like to be a better leader – more successful? I would. So I plan to participate in this survey. Please help research the relationship between leadership styles you and others use … And how each style might produce good outcomes, such as a thriving culture of philanthropy. Who’s doing this research? People I really admire and respect. The very trustworthy Hartsook Centre for Sustainable Philanthropy (founded by Adrian Sargeant with Jen Shang as the research director).